The 4th ASEAN Summit in 1992 called for ASEAN Member Countries to help “hasten the solidarity and development of a regional identity through the promotion of human resource development so as to further strengthen the existing network of leading universities and institutions of higher learning in the region.” This idea led to the establishment of the AUN in November 1995 with the signing of its Charter (Hiến chương) by the Ministers (Bộ trưởng) responsible for higher education from six Member Countries, and with initial participation of eleven universities from six countries. A Memorandum of Agreement on the establishment of the ASEAN University Network was subsequently signed by the presidents/rectors/vice-chancellors of the participating Member Universities. The Agreement mandated the formation of a Board of Trustees and a Secretariat headed by an Executive Director. When the First AUN Board of Trustees Meeting convened in November 1996, the above priorities guided the AUN’s immediate plan of work in four key areas: student and faculty exchanges, ASEAN studies, information networking, and collaborative research. 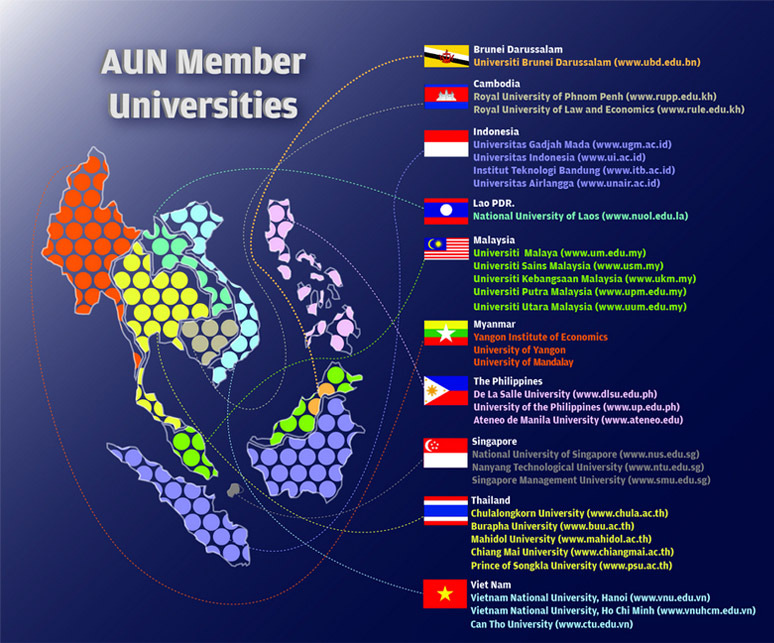 Later, when the ASEAN Charter was signed by the Ministries of 10 ASEAN Member States in 2007, AUN became tasked as a key implementing agency of ASEAN in the Socio-cultural portfolio. AUN conducts programmes and activities to encourage and promote higher education cooperation and development to enhance regional integration in achieving global standards. Our current activities are categorised into five areas covers (1) Youth Mobility, (2) Academic Collaboration, (3) Standards, Mechanisms, Systems and Policies of Higher Education Collaboration, (4) Courses and Programmes Development and (5) Regional and Global Policy Platforms. To serve as the policy-oriented body in higher education in the ASEAN region. Academic quality is multi-dimensional concept in view of varied stakeholders’ needs and expectations. AUN recognizes the importance of quality in higher education, and the need to develop the holistic quality assurance system to raise academic standards and enhance education, research, and services among AUN Member Universities and non-Member Universities. Since then, AUN-QA has been fine-tuning the AUN-QA System to support, enhance, and sustain the level of quality assurance practiced by the higher education institutions in ASEAN. This is where QA practices are shared, tested, evaluated, and improved. Upon completion of the AUN-QA Actual Assessment, the University qualified with any of the certification status can use the relevant AUN-QA logo and certificates within the validity period. The AUN-QA Logo and Certificates can only be used on corporate materials, brochures, publicity materials, website and premises of the awarded university. Otherwise, written permission must be sought from AUN Secretariat. The logo and certificate must be used as one entity and no distortions or modifications are allowed.